Cradles can make tending to a baby easier in the middle of the night, keeping baby close to mom and dad for feedings and diaper changes. Cradles are also small and portable, making them more convenient than a crib since they can fit into more spaces and be moved easily. However, cradles are only a temporary solution. After a few months, cradles may be unsafe for babies, and it will be time to start making the transition to a crib. Cradles provide a small sleeping space with shallow sides. When babies start to grow, they may become too big for the space very quickly. Their arms and legs may start to push against the sides, and they may be cramped and uncomfortable. In addition, most cradles can only support a certain amount of weight. The weight limits vary by brand and model, but most cradles only support approximately 20 to 30 pounds. When babies approach this limit, it is no longer safe for them to be in the cradle. The shallow sides of a cradle don't pose much of a risk to newborns, since they couldn't go very far if they tried. However, once a baby starts to push up, rock or roll over, the cradle poses a serious risk for falling. Most babies reach this milestone at approximately 2 or 3 months old. Cradles with deeper sides may be safe for babies as old as 8 months, when they can pull themselves to a standing position. Cradles don't offer a lot of space to stretch out. Any items that go in the cradle have the potential to fall on top of baby or to block his airway. The American Academy of Pediatrics recommends keeping toys and soft bedding such as sheets and blankets out of a baby's sleeping space. Instead, parents should choose appropriate sleep clothing or a sleep sack to keep baby warm and comfortable. The transition to the crib can be tough, especially if a baby has grown accustomed to sleeping in a cradle. Mark A. Bradenburg, of St. Francis Hospital in Oklahoma, tells BabyCenter that parents can help babies make the transition by putting them in the crib for short periods during the day. For example, babies can be put in the crib to play for a few minutes or to watch parents while they complete household chores. Seeing the crib as a safe and inviting space can help babies accept it for sleeping at night. 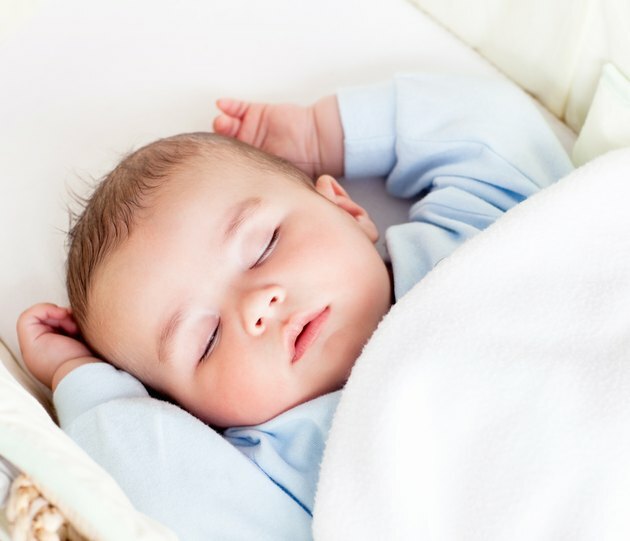 Baby Center: When Can My Baby Move From a Bassinet to a Crib?